Still one of my favourite Orange County punk bands from Back in the Day, this disc is mostly a live Guttermouth show from the summer of 1994 with some studio tracks from '98. It's produced and recorded by The Vandals' Wally - excuse me, I mean Warren Fitzgerald from the Vandals (old habits die hard). 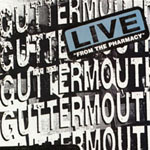 Guttermouth was mostly known for good-natured misogyny, their sense of humour, getting very fucked up on stage and in the studio and on days of the week ending with a "y," and spending most of their time on stage trying to remember how to play their instruments. They were a lot of fun. The packaging for this package is brilliant, truly capturing the Guttermouth sense of the aesthetic. In the side panel of the CD case is a real hypodermic needle-with the pointy part removed, of course. I actually took the entire box apart to see whether the needle was intact or not (and I can't be the only one), so I know it used to be real.